Anna Mary has cerebral palsy and spends a good part of her day in a wheelchair looking up at the world. 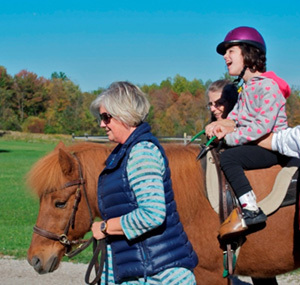 When she comes to Fieldstone Farm she is able to get out of her chair and up on horse and see the world in a whole new perspective. “You can just see her eyes brighten as she gets on the horse,” says Bobbin Davis, a licensed physical therapist who has used the movement of a horse to help Anna Mary build strength and endurance. Anna Mary has made significant progress since she started in our hippotherapy program about two years ago. Her increased core strength from riding transfers into other aspects of her life. She is able to stand up longer, walk further and she has improved her posture and flexibility. Riding also helps her bone health because it is a weight-bearing exercise. Feeling the horse walking underneath her helps her feel the sensation of a walking gait. Ultimately this could help her learn to walk on her own someday. The movement has even helped her to start speaking. Her Mom says after several weeks of riding, Anna Mary would wake up in the middle of the night and start saying audible words such as “ma, ma, ma,” and “ba, ba, ba.” Her speech therapist attributes the increased language to Anna Mary learning to push air through her diaphragm because of her physical therapy on the horse. When you ask Anna Mary’s Mom about her daughter’s experience at Fieldstone Farm, she lights up. It feels so good to see her smiling, her mom says. She is so happy on a horse. When they turn onto Snyder Road, Anna Mary gets very excited because she knows she is near the farm. Anna Mary has always loved horses and coming to the farm and working with horses has opened up a whole new world for her. She is more confident and feels Fieldstone Farm is a place where she belongs. It is a place in which she can participate in a sport just like her siblings.